The Lobby Lounge at the InterContinental is 'the' place for cocktails, where every mover and shaker can be seen sipping effortlessly on something fabulous. 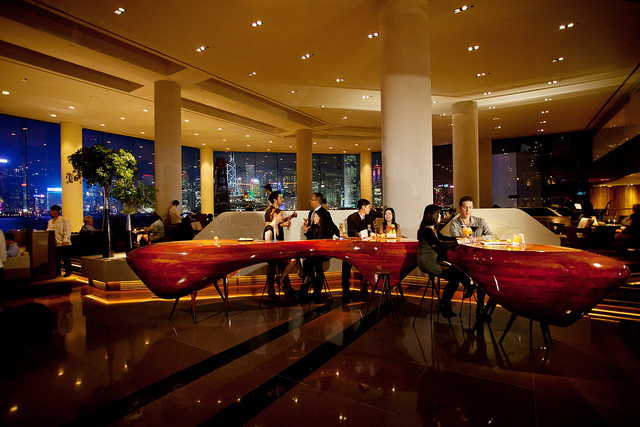 Set against the iconic backdrop of Victoria Harbour and that skyline, this Hong Kong classic has got a whole lot of wow factor. 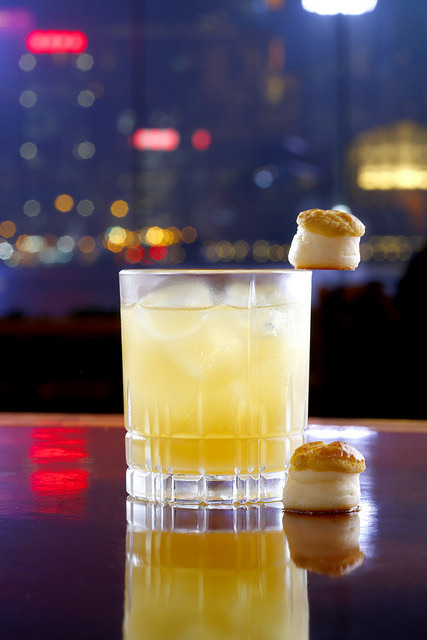 To compliment the splendour of the surroundings, the InterContinental has just launched an extensive new cocktail and appetiser menu in the Lobby Lounge that is reflective of the dynamic and compelling energy of HK itself. Despite the fact that the hotel is situated in busy TST, the Lobby Lounge still manages to retain an ambience of chic, old Hollywood glamour that cannot be replicated anywhere else in the city. With seven alcoholic cocktails and five non-alcoholic varieties, there is something for everyone on this long list of creations. While I do love an old reliable, I often find drink menus repetitive, and it can be difficult to discover innovative mixology. Rest assured that the curators at the Lobby Lounge have blended these beverages with a great splash of creative thought – there's not a cosmo or mai tai in sight! The elements of each drink – from the name to the ingredients – are intrinsically linked to aspects of local history and culture, taking the diner through a snapshot of storytelling with every sip. One of my favourites was the New Territories, a refreshing blend of gin, tonic, citrus, cucumber and bitter melon – a contemporary interpretation of a standard G and T. This would be ideal for cooling off during the summer season or as a light aperitif before dinner. On that note, Tea Time, inspired by the bo lo bao (pineapple bun), also had a tropical tang of buttered rum, pineapple, local honey and citrus. I was apprehensive that this could be a little too sickly, but it turned out to be the perfect sweet treat. For a different flavour, I loved the spicy, heady notes in From Condiment to Confection, a mix of bourbon, citrus, local honey, ginger and bitters; this is a great winter warmer for the colder snap. 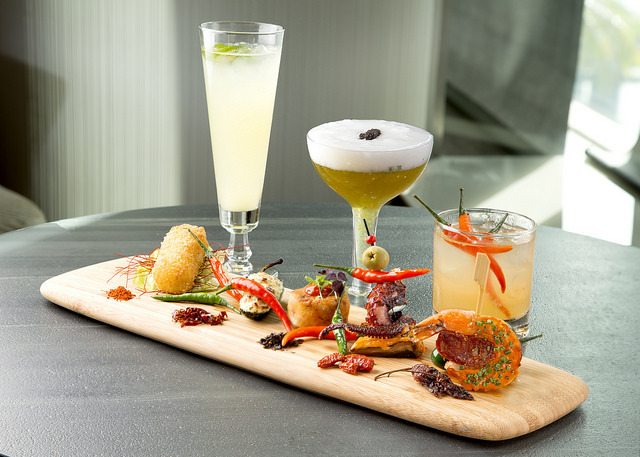 The appetisers that accompany these indulgent cocktails are a combination of festive features for the Lunar New Year (say hello to the best turnip cake ever) and firm favourites like the breadcrumbed fish and chips and the scrumptious Wagyu beef balls. It was the chilli plate that – quite literally – tickled my taste buds, though, as the snack selection ranged from one to five on the spice-ometer. For those a little shy of spice, the chilli cheese nuggets and stuffed jalapeños pack just the right amount of punch. If you're feeling like a bit more fire, the crispy octopus with piri-piri mayo and king prawns with chorizo are unforgettable. The Lobby Lounge features live entertainment nightly from 6pm–12:30am, with one of Asia's leading jazz singers, Jennifer Parlor, performing every Thursday from 9:45–11:45pm. With this sublime soundtrack, this is the only place to marvel at the harbour light show or simply enjoy an #852TAIL with a view.